New York Times writers Cornelia Dean and Rachel Nuwer reported on Oct. 18, 2011 that "a lethal and highly contagious marine virus has been detected for the first time in wild salmon in the Pacific Northwest, researchers in British Columbia said on Monday, stirring concern that it could spread there as it has in Chile, Scotland and elsewhere." Called infectious salmon anemia (isa), the virus, which has its origin in Europe, has devastated fish net-pen farms in Chile, but until now it had never been detected on the West Coast of North America, despite the rapid growth of net-pen aquaculture in British Columbia and the importation of millions Atlantic salmon eggs by the aquaculture industry over the past 25 years, primarily from Scandinavia and Iceland. The virus was detected in two young sockeye in a study of juvenile sockeye salmon in Rivers Inlet, B.C., undertaken following a decline in young sockeye there. Richard Rutledge, an environmental scientists at Simon Fraser University who leads the study, said he believes the virus spread from the aquaculture industry and that it could have "a devastating impact" not just on the region's farmed and wild salmon but on the many species that depend on them in the food web, like grizzly bears, killer whales and wolves. He said "No country has ever gotten rid of it once it arrives." He said that no connection has been made between the imported salmon eggs and the two infected sockeye young (captured some 60 miles from the nearest net-pens) but the isa virus discovered in them was of the European strain. Alexandra Morton, a research scientist and activist who has specialized in studies on the threatening impacts of net-pen aquaculture on native wild-salmon fisheries in British Columbia (Ross Purnell's story in the Feb/March issue 2012 issue of Fly Fisherman) , and who collected the Rivers Inlet sockeye samples, called the isa discovery "a cataclysmic threat" to both salmon and herring, which can also contract it. James Winton, leader of the health research group at the Western Fisheries Research Center in Seattle, an arm of USGS, described the isa discovery as a "disease emergency" and called for immediate research on how far the virus may have spread. According to the federal Centers for Disease Control and Prevention isa morphed from a benign form in nature into a "novel virulent strain" when salmon stocks entered Norway's densely packed salmon farms. Rather than getting picked off by a predator, a sick fish would undergo a slow death in a crowded pen, shedding virus particles. "Salmon farm installs netting to limit need to shoot invading animals"
"Des saumons du Pacifique infectés par un virus de souche européenne"
"Deadly salmon virus raises concerns in Wash."
"Senators Begich and Murkowski take action against 'Frankenfish'"
the virus to other stocks and species of native fish"
contagious virus recently detected in wild salmon in British Columbia. other species that depend on them, the researchers said. ocean ... and salmon species stray," he said. include killing fish, he said. who is not connected to the British Columbia study. repeat it, then your level of confidence will increase." there's any involvement with the aquaculture industry." Washington and has not detected the virus. Atlantic salmon off its coast. Norwegian-owned companies who control 92% of B.C. 's salmon farms. floodgates to legal action will inevitably be opened. case study in negligence and malfeasance. close the net on open net pen salmon farms. the number of marine mammals killed. in an effort to reduce the number of marine mammals killed. cannot continue," said James Gaskill, MHC production director. officially provided," said spokeswoman Christine Patrick. commercial fishing operations, including fish farms. commercial fish products comply with the act's import provisions. organizations does not look at the whole picture. see they are facing similar challenges," Walling said. and sea lions are drastically reduced, if not eliminated. reduce or eliminate these interactions." include a stainless steel core and will cost $250,000 to outfit each farm site. to move into the area. steps to eliminate lethal interactions." has previously inflicted heavy losses on Atlantic fish farms. depending on the susceptibility of these stocks," he says. British Columbia shut down while the outbreak is investigated. Inlet, sur la cÃ´te du Pacifique. saumons de l'Atlantique par les fermes d'élevage. prédateurs, ce qui facilite la contagion. été découverts dans une région loin des fermes d'élevage. upstream to go spawn. (Photo: Getty Images). pens, rather than being consumed by predators in the wild. "The potential impact of ISA cannot be taken lightly,"
from Europe to be used in the region's salmon farms. 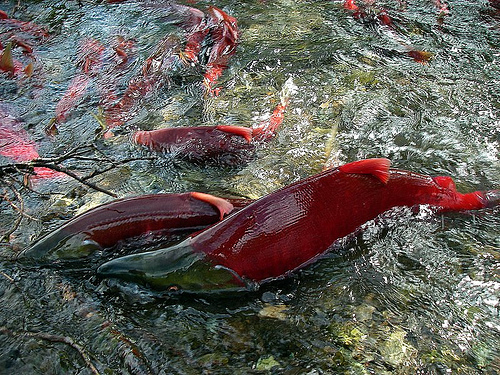 ongoing research into the collapse of Rivers Inlet sockeye populations. began ravaging salmon in 2007.
they had of this threat to our wild and farmed salmon. in losses, and ending more than 25,000 jobs. assess the spread of this disease and come up with strategies to contain it,"
of Fisheries and Oceans and their silencing of departmental scientists. salmon anemia has been diagnosed in sockeye smolts in the Pacific. virus has been present in the Pacific waters. investigation of this serious issue and threat to our fisheries? investigate this serious threat to our salmon fishery? support the work of Justice Cohen and the Cohen Commission. there is no communication from the department and scientists remain muzzled. councils. Their policy seems to be "hear no evil, see no evil, speak no evil"
and they hope these problems go away. They will not. efficient, effective and achieving the expected results of Canadians. approach to meet the needs of Canadians today and in the future. Fisheries Research Center in Seattle. be taken lightly," he said in a statement Monday. pathologist Gary Marty clarifies his own research. virus is not infectious to humans. that oversight of the aquaculture industry in B.C. has been compromised. Atlantic salmon at hatcheries should also cease. investigation needs to be set aside by both the Canadian and U.S.
and species of native fish. transfer and risks to native species. Deadly salmon virus raises concerns in Wash.
recently detected in wild salmon in British Columbia. has not found signs of infectious salmon anemia. border should step up research, surveillance and testing. suffering from a form of jaundice. media spokesperson, in an e-mailed response to the Progress. details would be evidence of prespawn mortality. of sockeye and coho in Fraser River tributaries feeding into the Harrison River. Dr. Morton reported on the yellow salmon she found on Oct 5. Fraser River two days ago I also found four yellow pink salmon. cartilage inside the fish's head was yellow. such a virus get here? that "there's something very wrong here." doing and who is doing it.